Southeastern Guide Dogs staff and graduates have been invited to attend the Blessing of the Animals Service at St. Joseph’s Episcopal Church in Boynton Beach, Florida on Sunday, September 27, 2009. The service begins at 4 p.m. and a special section in the front of the church has been reserved for everyone from the group. 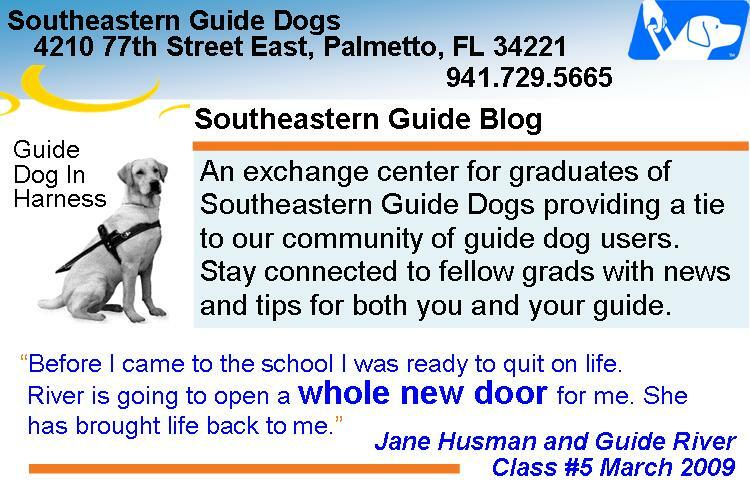 Southeastern Guide Dogs will be the first group to be blessed. Tables will be set up in the Parish Hall for talking to people before and after the service. Directions: I-95 to Woolbright Road. Woolbright east to the first stop light (Seacrest Blvd). South on Seacrest. Church is on the west side. You will see a soccer field and tennis courts. The church is at the top of the hill. If you would like to attend please RSVP to Kim Marlow, Area Coordinator for South Florida at kmarlow@comcast.net or call Kim's cell phone at 954-496-0776. Discuss with Kim any transportation needs you may have.